More than making up for its small size with an array of indigenous cultures, colonial architecture, scenic landscapes, and dense rainforests, Ecuador is one of the most fascinating nations in South America. Bordered by Colombia, Peru, and the Pacific Ocean and no larger than most US states, this beautiful country attracts climbers, trekkers, adventurers, and nature lovers to its lush, ecologically important forests; wildlife watchers to its famous Galápagos Islands; and sun seekers to its pristine tropical beaches. Once a part of both the Inca and later, the Spanish Empires, Ecuador still displays many influences from both groups, most notably in the rich culture of its people and the splendid colonial architecture of the capital city of Quito, much of which has been declared a UNESCO World Heritage Site. Since their "discovery" in the 16th century, the Galápagos Islands have intrigued and inspired visitors from around the globe. Named for the giant tortoises on the islands, this UNESCO World Heritage Site is home to a unique ecosystem that largely evolved without outside influences (mainland Ecuador lies some 1,000 kilometers to the east) and offers an exceptional opportunity for wildlife viewing. The Galápagos Islands remain one of the most active volcanic regions in the world, and the formation of the islands is still in progress. Most of the 13 large islands, six smaller islands, and 42 islets that make up the Galápagos were declared part of the Galápagos National Park in the 1950s, and visiting this fragile ecosystem can only be undertaken as part of a guided tour to designated visitor sites (there are, however, one or two areas visitors can go without a guide, including some areas popular with scuba divers). The main attraction here are its many bird species of which 28 are unique to the islands, including the Galápagos penguin, flightless cormorant, and waved albatross, and the 13 species of Darwin's famous finches. Hot Tip: Be sure to book a behind-the-scenes visit to the Charles Darwin Research Station in Puerto Ayora on Santa Cruz Island (tours of this important research facility can be made in advance of your arrival). High in the Andes, Quito, the capital of Ecuador, is filled with colonial architecture and is the largest historic center in South America. Preserved as a UNESCO World Heritage site with many old churches, beautiful public squares, and world-class museums, the city has long been a favorite with artisans and is a great place to shop for local art and crafts, from ceramics and wood carvings to colorful clothing. The most famous attraction in Quito's historic center is the San Francisco Church on the Plaza San Francisco. Dating back to the first half of the 1500s, the church's white-washed twin towers flank each side of the entrance to this massive complex. It's notable for its splendid Baroque interior and the Convent Museum of San Francisco with its religious paintings, sculptures, carvings, porcelain, textiles, and handcrafted furniture. Other beautiful churches to visit include La Compania de Jesus Church, constructed in the early 17th century and listed by UNESCO as one of the top 100 most important buildings in the world, and Quito's cathedral, Basílica del Voto Nacional, constructed in the 1560s. Be sure to explore Plaza Grande, a beautiful square surrounded by the cathedral, the Presidential Palace, the Archbishop's Palace, and the Municipal Palace, as well as Calle La Ronda, a buzzing street lined with restaurants, cafés, art galleries, and other entertainment. The beautiful city center of Cuenca, officially known as Santa Ana de los cuatro ríos de Cuenca, is in southern Ecuador and is a delightful city to explore on foot. Designated as a UNESCO World Heritage Site, the city brims with splendid colonial influences and architectural treasures spanning 400 years and encompassing both Spanish and Indian elements. The historic city center is also where many of Cuenca's key attractions lie, one of the most important being the Old Cathedral of Cuenca (Iglesia del Sagrario), built in 1567 from stones taken from nearby Inca buildings. Highlights include its old organ from 1739, its tower clock from 1751, and the Museum for Religious Art. Also worth a visit is the massive New Cathedral of Cuenca, built in the 1960s and hard to miss for its three beautiful blue-tiled domes. The Church of San Sebastian with its mix of Gothic and Neoclassical elements is also worth seeing. As you wander Cuenca's pleasant narrow streets, be sure to spend some time exploring the many squares and parks, including Calderon Park in the heart of the old town; Plaza San Blas Square, dominated by the Church of San Blas; and Plaza de San Francisco with its merchants selling textiles and other goods. Two of Ecuador's most popular national parks, Cotopaxi and Cajas, are within easy driving distances from the cities of Cuenca and Quito and make wonderful day trips. Of the two, Cotopaxi National Park (Parque Nacional Cotopaxi), just 50 kilometers south of Quito, is perhaps the best known thanks to the massive (and still active) Cotopaxi volcano dominating the area, along with the smaller Rumiñawi and Sincholagua volcanoes. About 30 kilometers from Cuenca in Ecuador's stunning highlands, Cajas National Park (Parque Nacional Cajas) offers a different experience due to its numerous hills and valleys, making it a perfect place to hike and bike. It's also a delight for watersports enthusiasts, particularly kayakers and canoeists, thanks to its more than 270 lagoons and glacier-fed lakes. Finally, Podocarpus National Park, often referred to as the "Botanical Garden of America," offers a diverse range of flora and fauna. In the southeast part of the country, its humid mountain forests are home to more than 4,000 species of plants and trees (some as tall as 40 meters), including the famous cinchona, Ecuador's national tree. 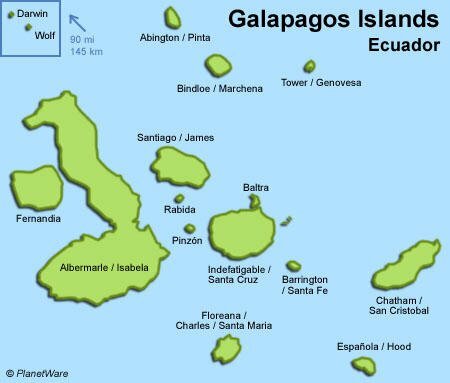 Ecuador's largest city in terms of population, the Pacific port of Guayaquil is well known as the gateway to the Galápagos Islands. In addition to its many historic sites, Guayaquil boasts great shopping and entertainment venues in its many picturesque squares and plazas, and along its splendid waterfront. The highlight for those who enjoy exploring on foot is the magnificent Malecón 2000, a two-and-a-half-kilometer-long boardwalk adjacent to the Guayas River. Undoubtedly one of the world's most memorable promenades, this remarkable urban renewal project winds along the river's west shore past many of the city's best attractions, including important historical sites, gardens, museums, and entertainment. For a real treat, take a tour boat on an evening trip up the river, when the city is lit up to beautiful effect. Other highlights include the splendid Guayaquil Metropolitan Cathedral and Museo Antropológico y de Arte Contemporaneo with its fascinating displays and collections focusing on the country's rich culture and history. A visit to the stunningly beautiful Nariz del Diablo ("the Devil's Nose") should be on everyone's bucket list. Whether you're a train enthusiast or not, this spectacular part of the Andes mountains near the town of Alausí is best seen aboard one of the country's superbly restored railways, part of a network that stretches across the country to some of its most scenic locations. The 12-kilometer return trip to Nariz del Diablo is undoubtedly one of the most popular and includes a fantastic sightseeing trip aboard a train that zigzags through a number of switchbacks as it climbs the near vertical sides of the mountain to the viewing station at its top. You'll have the chance to experience the rich culture of the Andes, including a visit to the Puñuna Condor Museum with its exhibits and displays relating to the area's indigenous people. Thanks to its lovely surroundings and numerous hot springs, the small town of Baños de Agua Santa is a popular tourist destination within central Ecuador. At the western edge of the Amazon basin, Baños is nestled among dense jungle-like forests and offers numerous recreational opportunities including hiking and mountain biking. But the big draw are its mineral-rich hot springs and many waterfalls, some of them accessible from the town via a series of fun trails incorporating rope bridges with incredible views over the falls and their deep pools. Adventure sports such as whitewater rafting and kayaking are also popular here. More sedate pleasures include visiting landmarks such as the Virgen de Agua Santa church with its famous statue of Mary (it's claimed she appeared at one of the town's waterfalls) and shopping for local goods such as colorful carved balsa parrots while enjoying the town's famous "melcocha," a type of candy made from cane sugar. In a pleasant valley surrounded by mountains lies the picturesque town of Otavalo. The town's big draw is its excellent market where locals and tourists alike come to buy colorful locally-made rugs and blankets, sweaters, bags, and other wool products made by the indigenous Otavaleños people. Other notable items are the unique tagua nut jewelry, leather goods, indigenous costumes, as well as many interesting food items, in particular locally-produced spices. If visiting in June, be sure to check out the famous Inti Raymi (Festival of the Sun) music festival featuring numerous local musicians with their distinctive instruments and sounds. Another excellent place from which to experience some of the vast Amazon basin is the city of Tena, capital of the province of Napo. Famous as Ecuador's cinnamon capital, Tena was established by missionaries not long after the Spanish arrived in South America and is an increasingly popular destination for travelers due to its many opportunities for adventure. Highlights here are jungle excursions into the Amazon, along with fun river journeys including whitewater rafting, canoeing, and kayaking along the Tena, Misahualli, and Napo Rivers, the latter of which flows directly into the Amazon. For those who enjoy their river action a little smoother, Tena also boasts a superb pedestrian bridge and tower high above the Tena River offering great views of the city. While best known for its ecotourism and adventure travel opportunities, Ecuador also boasts a number of beautiful beaches worth visiting, whether for a short break from sightseeing or as a base for a longer sun, sand, and sea vacation. One of the most popular areas, due to its many beach resorts, is the coastal city of Salinas, a little west of Guayaquil and boasting a consistently warm climate year-round. Also popular is the Pacific coastal city of Bahía de Caráquez. On a pretty peninsula jutting out into the ocean, Bahía attracts many tourists with its fine beaches, numerous hotels, and lively entertainment scene. Another popular area, particularly among younger travelers and surfers, is Montañita in the south coastal region of the country (for families, head a little further south to the quieter beaches of the fishing village of Ayangue).